Recently I attended the annual conference of the Association of Slavic, East European, and Eurasian Studies (ASEEES) in San Antonio, Texas. One interesting panel examined Russian/East European development assistance to the Third World during and after the Cold War, a subject I had done some work on in my 2013 book Aiding Afghanistan: A History of Soviet Assistance to a Developing Country. Of particular interest to me was a paper by Patty Gray of Maynooth University in Ireland, which discussed Russia’s move from being a recipient of development assistance after the collapse of the Soviet Union to once again being a donor. 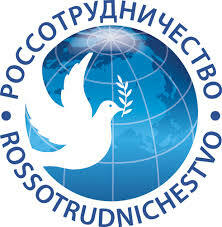 Russia’s contemporary aid agency is Rossotrudnichestvo (Russian Cooperation in English). 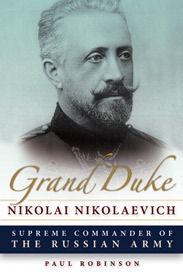 Gray pointed out that this organization evolved not from the Soviet institutions which were involved in development assistance but rather from those which handled cultural ties and exchanges with foreign countries. Because of this, Rossotrudnichestvo has to date focused on cultural matters. However, the organization’s website recently added a section devoted to ‘international development assistance’ which speaks of providing ‘financial, technical, humanitarian and other aid, helping the social-economic development of states’. As yet there is not much evidence to indicate what this will mean in reality. In Soviet times, development practice closely tracked academic theory. With this in mind, I asked Dr. Gray whether there even was any modern Russian development theory. Her answer was revealing. There are apparently a handful of contemporary Russian textbooks on development theory, but there are no university programs dedicated to the subject and very few academics are paying any attention to it. To overcome this deficit, the European Union (EU) has been running courses on the subject for Russians and others from Eastern Europe. According to Dr. Gray, the EU courses do not present different concepts of what development is and how it can be helped, but rather teach a single model (the EU’s model) which it is assumed students will apply once they go home. In practice, though, said Dr. Gray, students do what is expected of them and parrot what they are taught in order to pass the course, then when they go home mainly ignore it all in favour of their own country’s traditions and experiences. This story neatly encapsulates the arrogance of much of Western ‘capacity building’. In theory, we know that local institutions matter and that you cannot impose the same template on every country. But we keep on acting as though you can. Soviet development assistance was not notably successful, but its results weren’t generally any worse than that provided by its Western competitors. As it takes up this activity once again, Russia needs to start thinking seriously about how it can make its aid effective. This means doing more than simply copying a template provided by the West. This week, my course on ‘Russia and the West’ came to an end, and as usual I finished with a Russian-inspired lunch for my students. 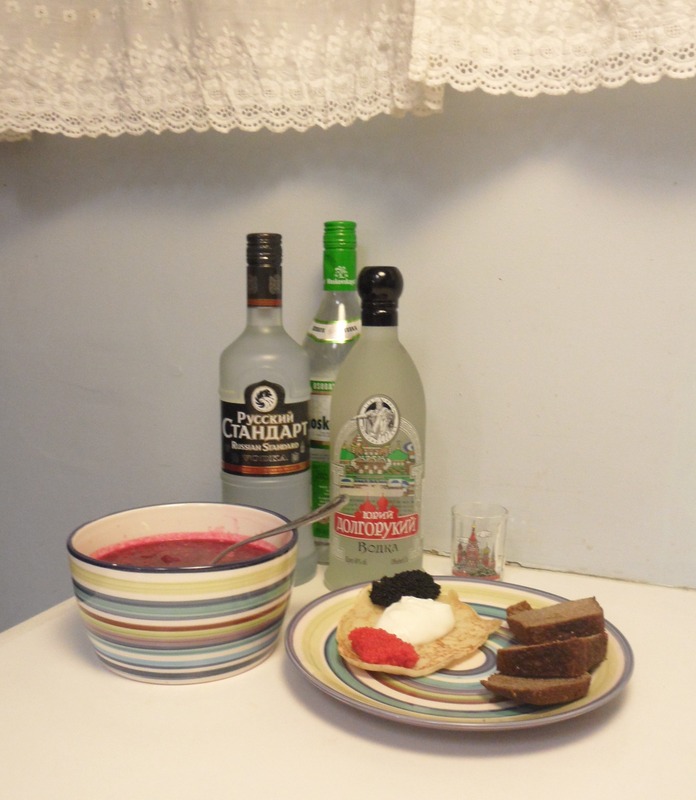 So for this week’s object, here is a picture of the main menu: blini with sour cream and caviar; borshch and Borodinskii bread; and vodka. Na zdorov’e! On 4 December there will be a conference at the University of Ottawa about Ukraine, sponsored by the Graduate School of Public and International Affairs (GSPIA) and the Sociology and Anthropology Graduate Students Association. Details of the conference can be found here. I will be giving a talk about ‘Russia’s role in the war in Donbass’. My first response to this is to point out that neither I nor any of the other presenters have received a kopeck from the Russian government. Nor has the conference, which in fact has received no funding at all other than the provision of tea, coffee and cookies courtesy of GSPIA. Euromaidan Ottawa is no doubt anxious that participants may present analyses of the events in Ukraine which do not coincide with its own narrative. It is right to expect this. But it is completely wrong to believe that anything which it doesn’t agree with is ‘Russian propaganda’, and that the ‘ostensibly objective academics’ who may challenge its point of view are saying what they are saying solely because they have been paid to do Moscow’s ‘dirty work’. I hope, in fact, that some members of Euromaidan Ottawa will attend the conference and that we will have the opportunity to engage in a civilized academic debate. One of the points I will emphasize in my own presentation is that many of the basic facts about events in Ukraine in the past year remain highly contested, as do the interpretations of those facts. I do not pretend to know the ‘truth’. Instead, I seek to move somewhere closer to it through a dialectical process which involves debate with people with other points of view. If they can teach me something which changes my mind, all the better. Sadly, the Euromaidan email does not make me think that its members see things the same way. Rather, it suggests that they believe they know what is true and see their role as being to suppress all alternatives to that ‘truth’. I hope that this is not the case. We shall see. ‘More and more every day we see features of Soviet style’. People remember the Soviet times, and as a result ‘people are scared’. Putin does enjoy large popular support, but in the big cities only 20%. The middle classes are against Putin, and he has given up on them. Aware that his regime is in danger, Putin has invented a foreign enemy (the West) to distract attention from domestic difficulties and to keep himself in power. ‘Putin needs these external problems’. Putin ‘has started to believe that he is if not God then something close’. Russia only has financial reserves for two years, then it will run out, and public opinion will shift against Putin. The next parliamentary elections in Russia will end with demonstrations such as those in 2012 or even worse. First, I could not but wonder what Kasyanov would do about Crimea if he ever came to power again. Hand it back to Ukraine? There would be an instant armed rebellion in Crimea, and he would have trouble finding a single Russian soldier willing to obey his orders to force the Crimeans to submit. Telling Western audiences that they shouldn’t compromise on Crimea is telling them to continue living in cloud-cuckoo land. Second, if Putin wants an external enemy, why give him one? If he stays in power due to his propaganda about the evil West, why does the West keep feeding that by expanding NATO, supporting revolution in Ukraine, and sanctioning Russia? Third, Kasyanov seems confused as to the state of public opinion in Russia and as to the likely political effect of sanctions. On the one hand, he claims that Russians are living in fear, but then he grudgingly admits that in fact they support Putin. Next, he says that sanctions don’t hit ordinary Russians, but then he says that it is the economic problems in part induced by sanctions which will turn Russians against Putin. Kasyanov ends up sounding as if he wants sanctions precisely because they will damage the economy and impoverish Russian citizens, turning them against their president. That may not be what he intends, but it’s the impression he leaves. Overall, Kasyanov’s discourse makes it clear why his clumsily named political party, the Republic Party of Russia – People’s Freedom Party, enjoys very little support in Russia, with just three elected representatives in regional councils throughout the whole of the country. No politician who calls for the international community to sanction his own country is going to draw an awful lot of votes. Russia and the West have long denounced one another for spreading disinformation. In a new report published by The Interpreter magazine, and entitled The Menace of Unreality: How the Kremlin Weaponizes Information, Culture and Money, authors Michael Weiss and Peter Pomerantsev go a step further and accuse Russia of ‘weaponizing’ information. Weiss and Pomerantsev have also discussed their findings in a podcast on Radio Free Europe/Radio Liberty’s (RFE/RL) Power Vertical blog. Land that was not so long ago the cynosure of the worst atrocities of modernity has once again become an active war zone, above which commercial airliners filled with hundreds of foreign-born innocents are blown out of the sky with impunity. A former KGB lieutenant-colonel, rumored to be the wealthiest man in Europe, stands an excellent chance of outstripping Josef Stalin’s tenure in power and now speaks openly of invading five separate NATO countries. As if to demonstrate the seriousness of his threat, he dispatches fighter jets and long-range nuclear bombers into their airspaces on a near weekly basis. First, the authors’ use of language distorts reality by suggesting that things which have happened just once are regular occurrences, so making them seem more threatening. Note, for instance, the plural word ‘airliners’. Precisely one airliner has been shot down over Ukraine. That is bad enough, but Weiss and Pomerantsev use deceptive language to suggest something even worse. Also, observe how the authors claim that Putin ‘now speaks openly of invading five separate NATO countries’. This no doubt refers to a statement by Ukrainian president Petro Poroshenko that Putin told him that if he wanted to he could have troops in Riga, Vilnius, Tallinn, Warsaw and Bucharest within two days. The word ‘speaks’ suggests a regularly repeated, ongoing habit, whereas in fact we have one instance in which Putin allegedly ‘spoke’. This is a subtle difference, but it is important. Second, the story of Putin threatening to invade NATO countries is entirely uncorroborated, and comes from a source with a strong interest in making Putin look bad. But even if true, it does not constitute speaking ‘openly’ of invading NATO countries given that the conversation was private. Moreover, we don’t know why Putin said what he did (if he did). Perhaps he did so in response to a threat from NATO, as a way of saying ‘don’t attack Russia because Russia can hit back hard and fast’, in which case his statement was defensive in nature, not aggressive. Context is everything, but Weiss and Pomerantsev make no attempt to address this. Instead they suggest that it is an objective truth that Putin is even now openly threatening to attack NATO. This is deceptive. Third, note how Putin is described as ‘rumored to be the wealthiest man in Europe’. Strictly speaking, this is not a lie. There is a rumor to the effect that Putin owns a majority share in the commodity trading company Gunvor, giving him a personal wealth of $40 billion. The problem with this preposterous rumor is that the only source for the information is an entirely unsubstantiated claim by Russian political analyst Stanislav Belkovsky, who is a cousin of the deceased exiled oligarch Boris Berezovsky, a man described by a British judge as a liar. Repeating unfounded rumors is an easy way of blackening somebody’s reputation, but it is not good journalism. Fourth, the paragraph repeatedly slips in irrelevant points whose only purpose is emotional – to turn the reader’s mind against Putin by means of association. See how I slipped in the stuff about Berezovsky in the last bullet point, to turn you against Belkovsky by associating him with a liar. Weiss and Pomerantsev use this trick repeatedly. Thus we have a reference to the ‘worst atrocities of modernity’, as if the current war in Ukraine is somehow comparable; then we have a mention of the KGB; and finally there is a comparison with Josef Stalin, a man who oversaw the deaths of millions of people. Weiss and Pomerantsev at no point directly tell readers that they are making these comparisons, but their intent is clear. Finally, we read that Putin ‘dispatches fighter jets and long-range nuclear bombers’ into the ‘airspaces’ of NATO countries ‘on a near weekly basis’. But a complete list of incidents involving Russian aircraft assembled by the European Leadership Network lists only two NATO countries (the Netherlands and Estonia) as having their airspace violated in the past twelve months, one of them (the Netherlands) only once. Even the more regular alleged intrusions into Estonian airspace (about five in the past six months) are not ‘near weekly’ and in any case ‘result from an unsolved airspace issue where Russian air traffic control overlaps Estonian airspace.’ Furthermore, none of these intrusions involved nuclear bombers. Such aircraft have entered the Air Defence Identification Zone (ADIZ) of the United States, but ADIZs are not part of national airspace and entering the American ADIZ is a not a violation of U.S. sovereignty. Contrary to what Weiss and Pomerantsev write, there are no instances of nuclear bombers entering the airspace of NATO countries. All these distortions appear in just one half of one paragraph. The authors accuse the Russian media of disinformation, but they are guilty of the same thing themselves. Also interesting is the organization Weiss works for. The Interpreter magazine is a product of The Institute of Modern Russia, whose president (and source of funding) is Pavel Khodorkovsky, son of another disgraced former oligarch, Mikhail Khodorkovsky. It is relentlessly hostile to the current Russian government. So too is The Power Vertical podcast. The Americans did not found and subsidize Radio Free Europe and Radio Liberty during the Cold War for the fun of it. Rather, these radio stations had the specific purpose of subverting communism in eastern Europe. To some extent, the subversive objective remains unaltered, at least as far as Russia is concerned. You don’t turn to The Power Vertical if what you are looking for is balanced discussions of modern Russia reflecting multiple points of view. In short, The Interpreter and RFE/RL are ‘weapons’ too. Weiss’ and Pomerantsev’s report is very much of a case of the pot calling the kettle black. Or as the Russians say, ‘чья бы корова мычала а твоя молчала’: some people’s cows can moo, but yours should keep quiet. Hence the title of this post. 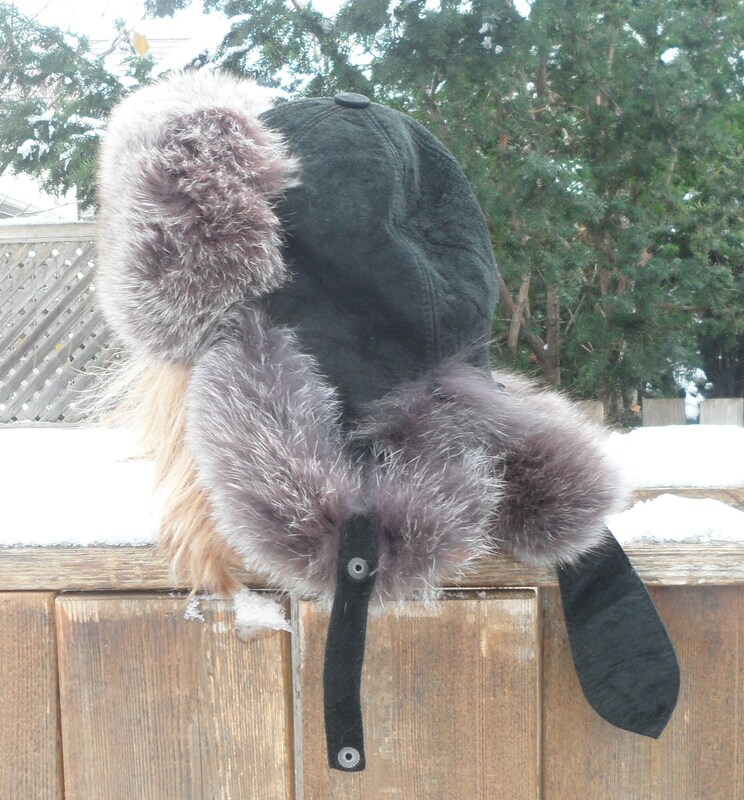 It snowed this week in Ottawa; time to get out the winter gear. So, for this week’s object I chose a hat I bought in Vladivostok a few years back. I have never been able to work out the purpose of the little black tail, and can only assume it is decorative.